The Five Drawer Bureau has three wide drawers and two side-by-side drawers. This mid-size dresser has flat side panels and a scrolled foot. All drawers are framed in raised molding with wood knobs and the drawers slide smoothly on wood runners for ease of use. The 5-drawer dresser offers storage for shirts, pants, sleepwear and undergarments. 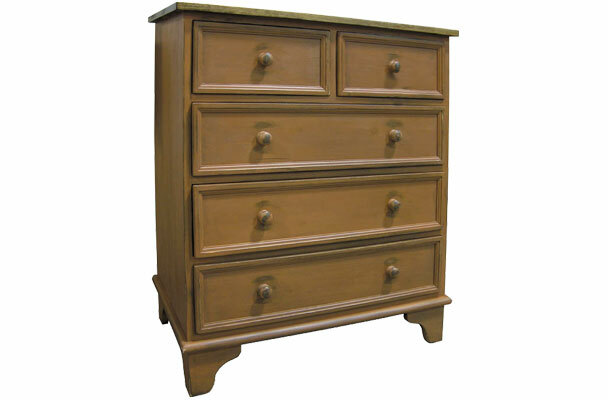 The Maison 5-Drawer Dresser is a classically-styled French country dresser perfect any bedroom. The chest of drawers provides deep drawer storage for everyday use. The charming dresser has (5) bevel panel drawers, and wooden knobs. The sturdy dresser drawers slide on wood glides that will stand up to years of daily use. 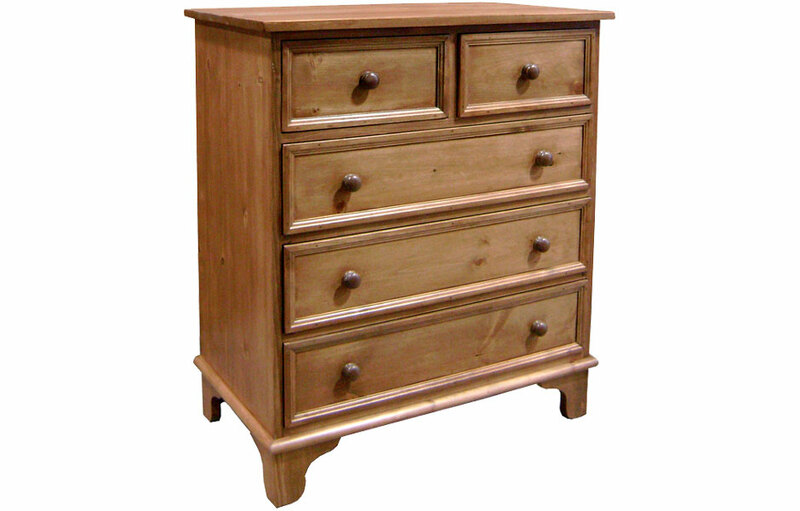 The dresser is made of solid wood including the tongue and groove backing. The entire drawer, including the bottom, is made of solid wood adding to its strength and durability. This 5-drawer tall dresser is part of the Maison style line, available in 4-drawer, 5-drawer, and 7-drawer options. The French country dresser is ideal for kid's rooms and adult spaces alike with it's deep, wide drawers. The thick, solid wood top is stained, water-sealed and waxed to stand-up to wet glasses and everyday use. The traditional tall dresser can be painted in a classic two-tone finish with a stained interior and top with painted exterior, or all-over one color finish. The Maison Five Drawer Dresser complements French Country, English Cottage, Farmhouse, Rustic, Transitional and Traditional style decors.